This book has a general introduction to the Shelley factory, identifies the tea ware shapes produced between 1910 and 1940 and has sections on nursery ware, earthenware and collector's notes. The majority of the book is taken up with descriptions of patterns applied to the Queen Anne, Vogue, Mode, Eve and Regent shapes. Appendices cover backstamps and quick reference guides for both china and earthenware. With over 180 pages, this A4 sized publication has many pages of colour illustrations. 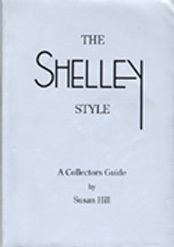 This publication is a must for any Shelley art deco collector.